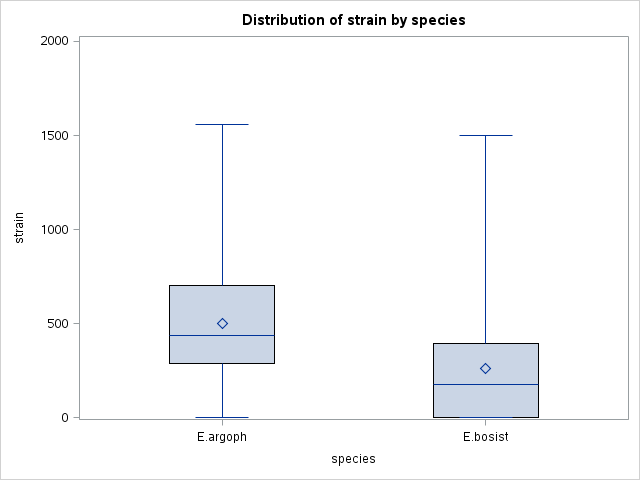 I was working with a small experiment which includes families from two Eucalyptus species and thought it would be nice to code a first analysis using alternative approaches. The experiment is a randomized complete block design, with species as fixed effect and family and block as a random effects, while the response variable is growth strain (in \( mu epsilon\)). When looking at the trees one can see that the residual variances will be very different. In addition, the trees were growing in plastic bags laid out in rows (the blocks) and columns. Given that trees were growing in bags siting on flat terrain, most likely the row effects are zero. Below is the code for a first go in R (using both MCMCglmm and ASReml-R) and SAS. I had stopped using SAS for several years, mostly because I was running a mac for which there is no version. However, a few weeks ago I started accessing it via their OnDemand for Academics program via a web browser. The SAS code is not that disimilar, except for the clear demarcation between data processing (data step, for reading files, data transformations, etc) and specific procs (procedures), in this case to summarize data, produce a boxplot and fit a mixed model. SAS boxplot for the data set. I like working with multiple languages and I realized that, in fact, I missed SAS a bit. It was like meeting an old friend; at the beginning felt strange but we were quickly chatting away after a few minutes.